It is time to forgo the sad sack lunch and get out of the office. To make lunch more exciting in the Loop, the City of Chicago’s Small Business Center (SBC) in the Department of Business Affairs and Consumer Protection (BACP) is hosting “Food Truck Fests” with licensed City of Chicago food trucks from March through October at Daley Plaza, 50 W. Washington St. and Willis Tower, 233 South Wacker Drive. The Daley Plaza fests are scheduled to be held weekly and the Willis Tower fests will be hosted monthly. 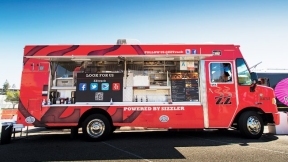 The events will include a rotating line-up of trucks offering different food options at each location. Food Truck Fest dates, times and participating trucks will be announced on the City’s SBC social media sites and using the hashtag #Chifoodtruckfests. The SBC is on Twitter at @ChiSmalliz, Facebook at /ChiSmallBiz, Pinterest at ChicagoBACP, and Instagram at ChicagoBACP. The Department of Business Affairs and Consumer Protection issues and regulates business licenses in the City of Chicago. For more information about BACP, the Small Business Center, and starting a food truck can be found at www.cityofchicago.org/SBC.